Distance measuring equipment (DME) is a transponder-based radio navigation technology that measures slant range distance by timing the propagation delay of VHF or UHF radio signals. Developed in Australia, it was invented by James "Gerry" Gerrand  under the supervision of Edward George "Taffy" Bowen while employed as Chief of the Division of Radiophysics of the Commonwealth Scientific and Industrial Research Organisation (CSIRO). Another engineered version of the system was deployed by Amalgamated Wireless Australasia Limited in the early 1950s operating in the 200 MHz VHF band. This Australian domestic version was referred to by the Federal Department of Civil Aviation as DME(D) (or DME Domestic), and the later international version adopted by ICAO as DME(I). Aircraft use DME to determine their distance from a land-based transponder by sending and receiving pulse pairs – two pulses of fixed duration and separation. The ground stations are typically collocated with VORs or Localizers belonging to ILS systems. A typical DME ground transponder system for en-route or terminal navigation will have a 1 kW peak pulse output on the assigned UHF channel. A low-power DME can be collocated with an ILS glide slope antenna installation where it provides an accurate distance to touchdown function, similar to that otherwise provided by ILS marker beacons. The DME system comprises a UHF transmitter/receiver (interrogator) in the aircraft and a UHF receiver/transmitter (transponder) on the ground. TRACK MODE: less than 30 interrogation Pulse-pairs per second, as the average amount of pulses in SEARCH and TRACK is limited to max 30 pulse pairs per second. The accuracy of DME ground stations is 185 m (±0.1 nmi). It's important to understand that DME provides the physical distance from the aircraft to the DME transponder. This distance is often referred to as 'slant range' and depends trigonometrically upon both the altitude above the transponder and the ground distance from it. A typical DME transponder can provide distance information to 100 to 200 aircraft at a time. Above this limit the transponder avoids overload by limiting the sensitivity of the receiver. Replies to weaker more distant interrogations are ignored to lower the transponder load. 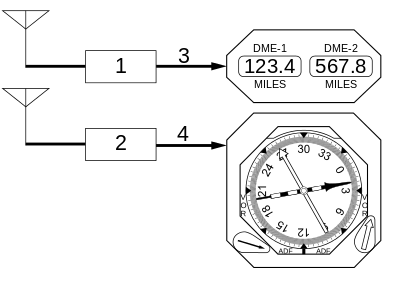 A terminal DME, referred to as a TDME in navigational charts, is a DME that is designed to provide a 0 reading at the threshold point of the runway, regardless of the physical location of the equipment. It is typically associated with ILS or other instrument approach. ↑ Department of Defense and Department of Transportation (December 2001). "2001 Federal Radionavigation Systems" (PDF). Retrieved 5 July 2011. ↑ Federal Aviation Administration (2 September 1982). "U.S. National Aviation Standard for the VOR/DME/TACAN Systems". ↑ Department of Defense, Department of Homeland Security and Department of Transportation (January 2009). "2008 Federal Radionavigation Plan" (PDF). Retrieved 8 September 2010.